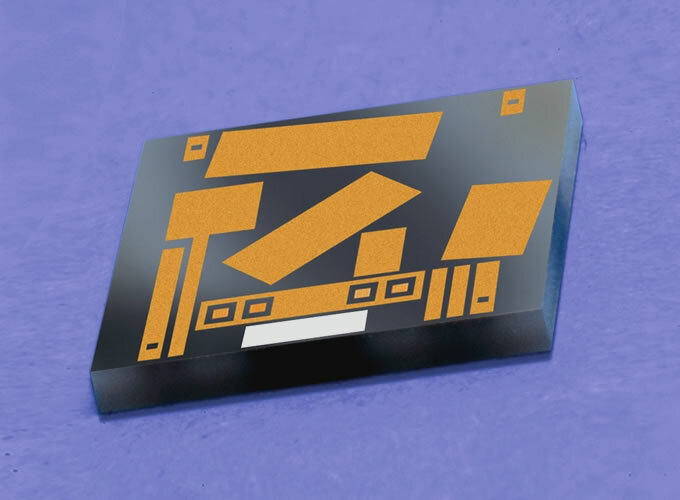 Thin film metallised Aluminium Nitride (AlN) submounts/carriers for mounting of laser diodes and associated components and devices for optical sub-assemblies. The AlN substrate material is available with as-fired, lapped or polished surface finishes. Standard substrate thicknesses are 0.63mm and 1.0mm with as-fired finish. Non-standard thickness material can also be fabricated. Substrates can be lapped and polished from 0.25mm thick up to 1.5mm thick. The Au and barrier layer thicknesses depend on the application. Generally for Au wire bonding 0.5µm minimum of Au is required. 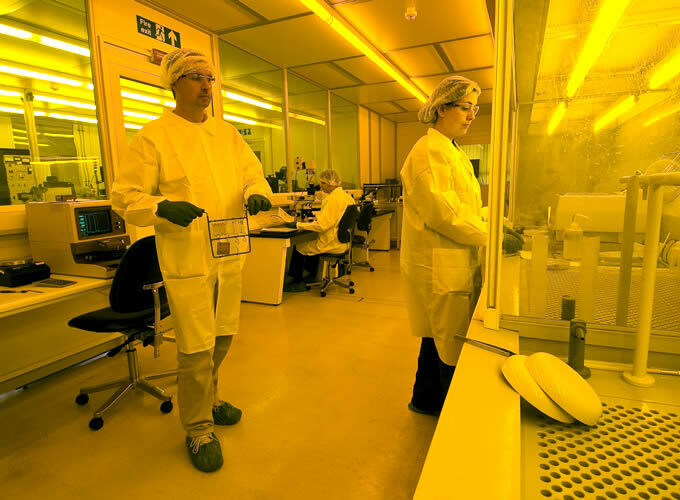 For Pt or Pd barrier layers a minimum of 0.2µm is usually specified. Front and back faces of the component can be electrically interconnected using pre-drilled metallised thru-holes. Typical hole diameter = substrate thickness. Plain submounts can also be fabricated with metallisation that wraps around one or multiple sides walls to connect the top and bottom faces. Wrap around connections can also be accomplished on patterned mounts, with due consideration to process limitations and cost. Alignment guides/fiducials can be incorporated into the design for subsequent automated assembly. 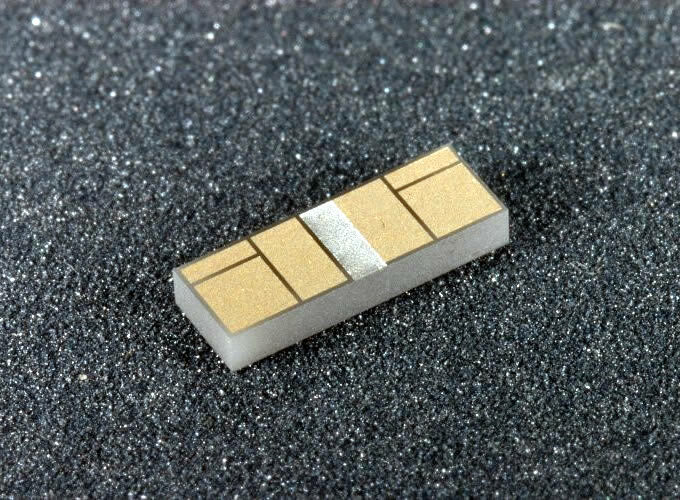 For laser mounting a thin layer of vacuum-deposited AuSn can be selectively applied over conductor areas. The standard alloy ratio is nominally 76Au/24Sn, normally at ~4-5 microns thick. 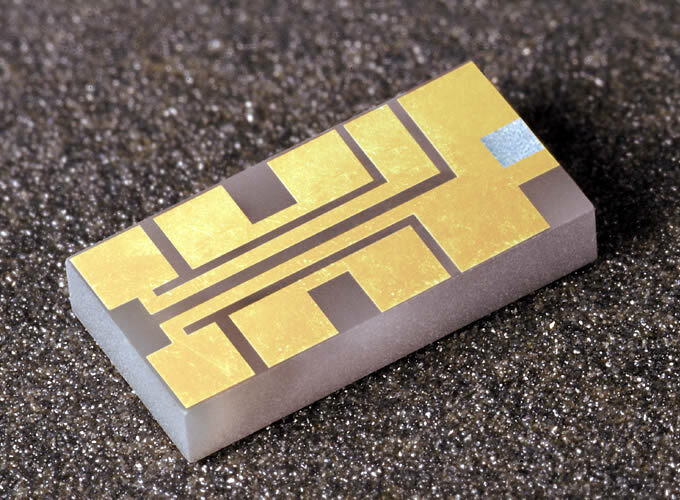 On reflowing, the Au in the underlying conductor and on the underside of the laser chip, combine with the pre-deposited solder to form an alloy approximating to the eutectic ratio of 80Au/20Sn. The resulting alloy flows and wets very well to both the laser and the carrier, resulting in excellent low-void joints minimising thermal resistance and hotspots. The alloy ratio can also be tailored for specific applications.